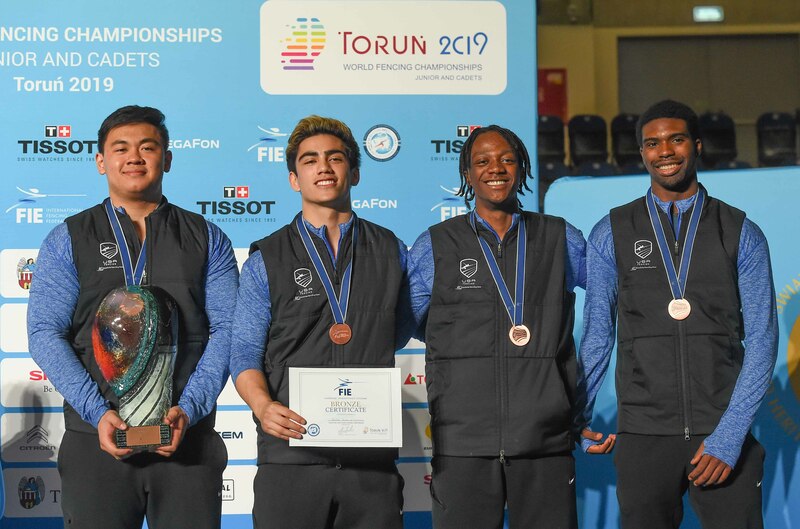 (Torun, Poland) – Both Team USA’s men’s and women’s saber squads fenced for bronze at the Junior World Championships on Monday with the men winning bronze and the women placing fourth. Fencing in the table of 32, all four athletes competed against Uzbekistan, winning seven of nine bouts to take the match, 45-40, with Saron anchoring just two days after winning individual bronze. Fencing hometown favorite Poland in the next round, Team USA doubled its opponent’s score at 30-15 after the first six bouts. Saron, Walker and Cai fenced a solid closing rotation to end with a 45-31 win. All four fencers competed in the quarter-finals against Great Britain, posting nine straight wins or ties for a 45-28 victory. In the semifinals Team USA fenced Russia – the No. 2 seed and 2019 Junior World silver medalists. Both teams fenced a close match, earning four bout wins a piece with Russia holding a 42-39 lead against the Americans going into Saron’s anchor bout against Vladislav Pozdnyakov. While Saron stole the lead at 42-40, Pozdnyakov put up five straight to take a 45-42 victory. The Americans went on to fence for bronze, but trailed after the first three periods when France built a nine-touch lead at 15-6. Walker was subbed in for the fourth bout and picked up key points for Team USA with a 7-5 win against Jules Geraud. The fifth bout would be pivotal as Cai, fencing in his final tournament of junior eligibility, made one of the greatest comebacks of the Junior Worlds so far. With France leading the bout, 20-13, Cai outscored Pianfetti, 9-3 to cut France’s lead to 23-22. Although Pianfetti scored once more, Cai took three straight touches to end the bout with a 12-4 run and a 25-24 lead for Team USA. Capitalizing on the momentum built during the fifth, Saron outscored Sebastien Patrice, 5-3, in the sixth and Cai took a 5-2 win over Gerarud in the seventh. By the end of the eighth, Walker had put up another win at 5-4 and the Americans had gone from a nine-touch deficit earlier in the bout to a seven-touch lead at 40-33. Pianfetti attempted a comeback in the anchor bout, but Saron clinched the gold for Team USA at 45-40. “It still feels unbelievable right now, just because of how down we were and thanks to [Erwin], he brought us back and gave us the courage to come back in spite of everything,” Saron said. Cai stated after the match that this was likely the final international tournament of a career that has included two team Junior World medals as well as an individual Cadet World silver medal and a team Cadet World title. Saron, Skeete and Walker all have at least one year of junior eligibility remaining and all agreed that they’re hoping for gold when the 2020 Junior Worlds are held in Salt Lake City. “We’re all super grateful to be here and have the opportunity to work with each other and hopefully we’ll see each other again soon,” Walker said. The U.S. Women’s Saber Team placed fourth in Torun after a heartbreaking 45-44 loss in the semis to Hungary who went on to win gold. Ranked No. 5 in the world, Team USA earned a bye into the table of 16, but struggled during the match against Poland who took a 15-11 lead after the first three bouts. Fencing in her first team event at a Junior World Championships, 18-year-old Ryan Jenkins (San Juan Capistrano, Calif.) came in as a sub and went on a 9-2 run against Malgorzata Zawodniak to bring the match back to a 20-17 lead for Team USA. Jenkins and teammates Nora Burke (New York City, N.Y.) and Tori Johnson (Peachtree City, Ga.) kept the match close for the next four bouts, giving Johnson a 40-38 lead going into the anchor bout where she blew through five touches against Zuzanna Cieslar to clinch a 45-39 win. With France leading by two at 25-23 in the quarter-finals, Johnson scored a 7-3 win against Coline Suzanne to pull Team USA ahead at 30-28. Burke split her bout against Amalia Aime, 5-5, in the seventh and Jenkins threw down a 5-1 victory over Suzanne in the eighth. Johnson split the anchor leg, 5-5, to give Team USA a 45-39 victory. In the semifinals, two-time individual Junior World medalist Liza Pusztai led the Hungarian team to a 25-15 lead after the first five bouts. Johnson put up a 9-5 win over Sugar Katinka Battai, a top-eight finisher in the cadet individual event, to cut Hungary’s lead to six. Chloe Fox-Gitomer (Portland, Ore.) was subbed in against Dorottya Berczy who picked up three red cards for false starting as Fox-Gitomer scored 11 touches to regain the lead for Team USA at 35-33. Jenkins controlled Battai for a 5-2 win, bringing Team USA to a 40-35 lead. In the anchor bout, Pusztai clawed her way back, scoring nine touches to cut the U.S. squad’s lead to one at 43-42. Johnson scored once more, but Pusztai answered with three straight to steal the win, 45-44. In the bronze medal final, Italy won four of the first six bouts to build a 30-19 lead. Burke tied Chiara Pagano Fusco at five and Jenkins matched with five more against Junior World individual medalist Benedetta Taricco. Johnson entered the final with an 11-touch deficit and scored five more before Giulia Arpino closed the match at 45-34.